That has to be one of the nicest ways of describing the madness that is bead art - raw tenacity. And boy did I feel it yesterday! Sunday night I started working on one of the few assignments that David has actually asked us to complete - to cover a found object. I believe my object originally belonged under the hood of a car. My working title is "Car Part #1". (Not saying that there will ever be a Car Part #2). It fits in the palm of my hand, to give a sense of scale. Anyone who can identify the part should chime in - I'd love to know what the darned thing actually is. So, Sunday night I cleaned it up, and started beading. 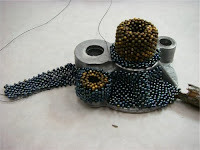 By the time I left the studio at 10:30 that night, I'd beaded the central threaded pipe. Monday I continued, working on the base. That is one complex shape, I've come to realize! I spent the day, and much of the evening working on it. A number of experiments got discarded along the way and as of 10:30 last night, this is all I'd accomplished. Though I did take a little over an hour yesterday evening to play over at the wood studio. They were wrapping more "sticks" for a barbed wire cutting this weekend and invited people to come and help out. 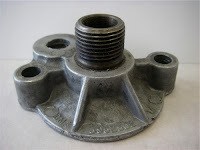 According to Jeffer in Kansas, it's an oil filter adapter for a Small block Chevy V-8. Dan and Dad agree with Jeffer. Dan said something about a remote. I think Dan probably said "We agree with Jeffer, so now give me back the danged remote!!" You guys have stunned David with the speed with which you identified what to us was some arcane bit of car engine!